This page details one or more prototype versions of Sega Channel BIOS (US). Several prototypes for the Sega Channel have been released over time, between 2009 and 2012. Most of these are very early in Sega Channel's development, but do show Sega Channel's user interface coming together. The boot-up screen got a huge visual revamp between the demo cartridges and the released Sega Channel cartridge. Sonic's sprite is taken straight from Sonic 2 in the demo cartridge, but is an original sprite in the final version. 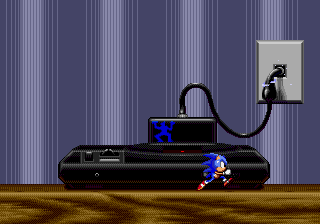 The Genesis was redrawn, the cable outlet had its "CABLE" label removed, and even the wall was changed. The wooden texture is much better defined in the final version. 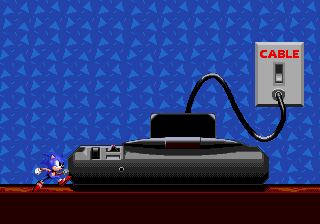 There's no animation of the Channel guy jumping out of the cartridge in the demo carts either, only a basic fade to the Sega Channel logo. Lastly, there's no copyright message shown at the beginning. The backgrounds in these builds are quite minimal compared to the final's backgrounds, closely resembling those featured in ToeJam & Earl. This page was last modified on 2 July 2016, at 17:16.